The next time you spot something resembling an alien craft looming overhead, check to make sure it's not hovering beside a mountain. If it is, there's a good chance you've spotted a lenticular cloud, like the one pictured above. Lenticular clouds aren't especially rare. They're actually a pretty common sight around mountains, where moist air – having recently passed over a nearby peak and collected above the summit's downwind face – cools and condenses into a broad, motionless mass. Stacked and lens-like in appearance, lenticulars are notoriously beautiful, but this shot of a nighttime lenticular, captured by astrophotographer Ben Canales back in March, absolutely blew us away. 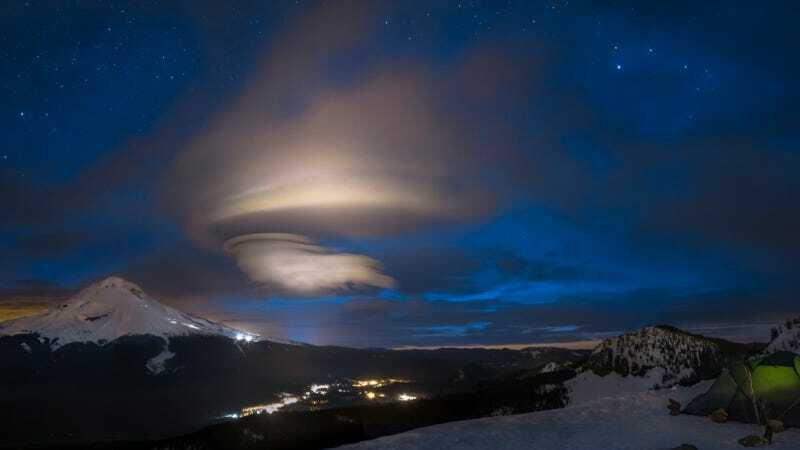 On the horizon is the stunning Mount Hood, but hovering above it is a jaw-dropping lenticular formation, illuminated by the resort lights beneath it. High in the sky, stars can be seen fading as the light of dawn approaches. Carnales captured this shot around 4:15 am after a long night of shooting, snapping the five photos that comprise the panorama just as the stars were disappearing. Check out tons more of Canales' work on Facebook, G+ and his website.